In May 2011 Fabasoft received the ISO 20000 certificate for the IT services Folio Cloud (today: Fabasoft Cloud) and Folio SaaS for the first time. The ISO 20000-1 standard is an internationally recognized standard for IT service management systems which documents the requirements for professional IT service management. With this certification, Fabasoft underlines its strategy of implementing international standards. ISO 20000-1 serves as a measurable quality standard for IT Service Management (ITSM). The aim of ISO 20000 is to deliver a higher quality of IT services to customers. Alignment according to the needs and requirements of customers plays a primary role. The standard also serves as an instrument to model processes in an optimized management system as they are described in the Office Government Commerce (OGC)s IT Infrastructure Library (ITIL). This encompasses such core processes as change, release, incident, problem and security management. 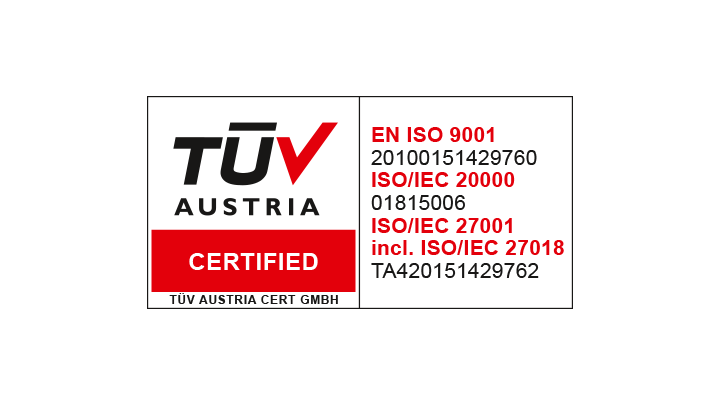 Fabasoft was successfully recertified in accordance with ISO 20000-1 by TÜV Austria HELLAS in July 2017. The first surveillance audit according to ISO 20000-1 was successfully completed in July 2018. The IT Service Management System of Fabasoft supporting the provision of Fabasoft Cloud, Fabasoft Folio SaaS and Mindbreeze InSite services to internal and external customers.